Angelina Jolie can add “flying” to her growing list of talents. From Hollywood star to on-set sorceress, Jolie appeared in full costume — including her villainous black horns — to film more scenes for her upcoming movie “Maleficent.” And it seems Jolie, 37, isn’t afraid to do her own stunts. New photos from the set of Disney’s epic “Sleeping Beauty” adaptation show the former “Tomb Raider” actress revisiting her action star days as she’s hoisted into the air by an enormous crane. 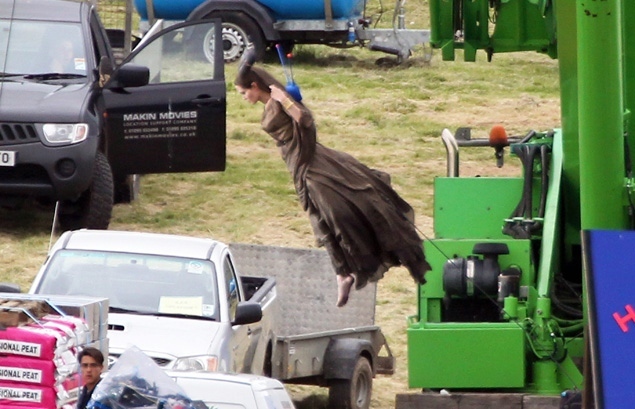 The fearless film siren is seen suspended high above the ground before flinging herself into the air while filming a high-action shot in the English countryside. 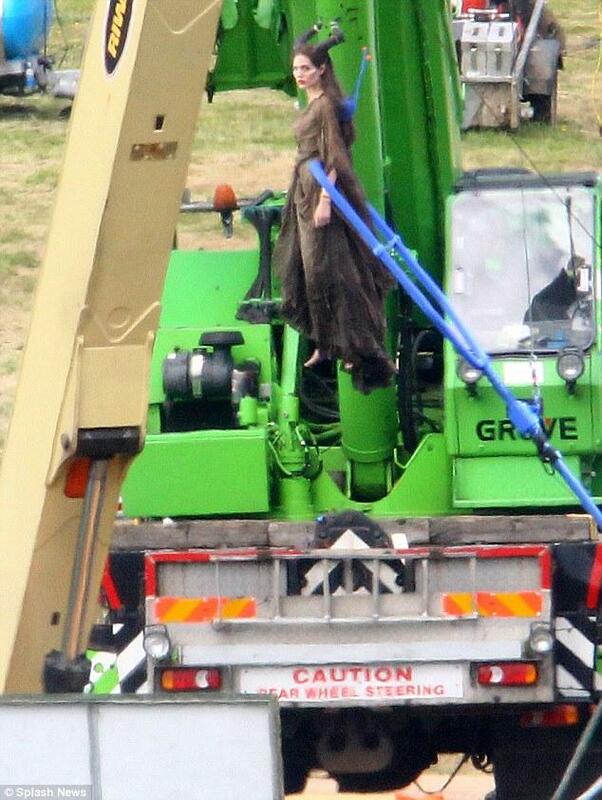 “Maleficent,” co-starring Elle Fanning, is currently being filmed in Buckinghamshire, England. The high-budget flick tells the famous fairytale from the notoriously evil Maleficent’s point of view. Jolie’s transformation into the misunderstood villainess has been stunning. 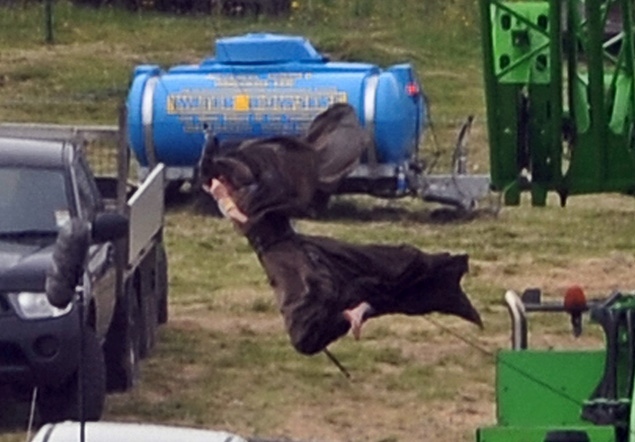 Photos from the forthcoming film first appeared last week showing Jolie on set in full wardrobe, complete with a brown cape and sorceress’s staff. She follows in the footsteps of other Hollywood leading ladies to take on evil queens this year, including Charlize Theron who stars in “Snow White and the Huntsman” and Julia Roberts in “Mirror Mirror.” “Maleficent” is expected to hit theaters in March 2014. Disney wisely released the first image of Angelina Jolie in character for the Sleeping Beauty re-imagining Maleficent merely one day before the first set photos surfaced, and now some new set photos have landed online that give us a look at Jolie in stunt mode. 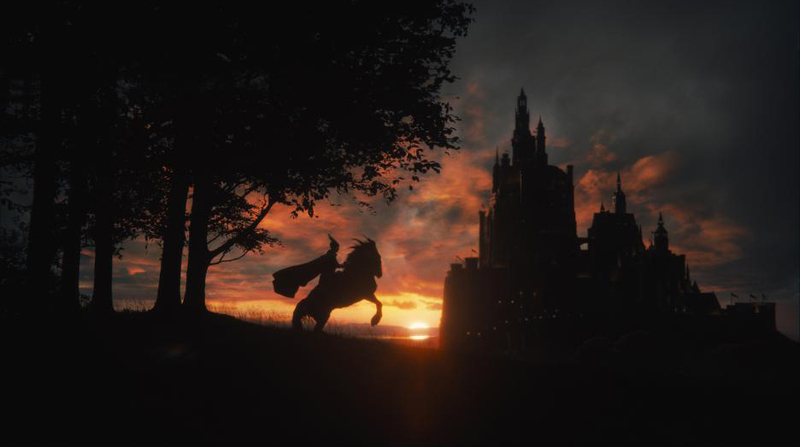 The film tells “the untold story of Disney’s most beloved villain” and “reveals the events that hardened her heart and drove her to curse the baby, Aurora.” I’m not really sure why Maleficent is getting her britches in a twist because she looks to be having a damn good time flying around and being evil in this batch of images. We also get a look at a small band of soldiers on horses that’s a tad reminiscent of Snow White and the Huntsman. 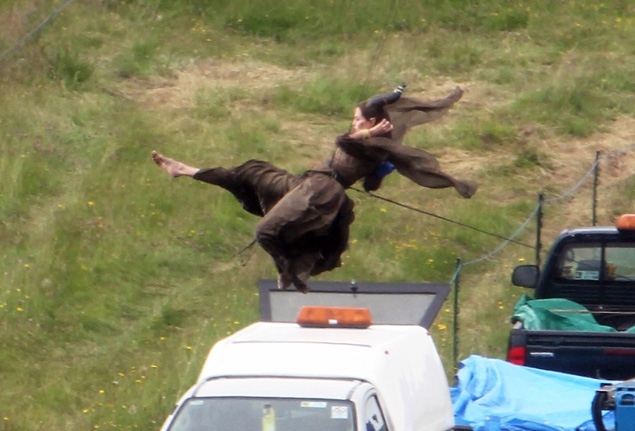 Hit the jump to check out the set photos. Directed by Robert Stromberg, the film also stars Sharlto Copley, Elle Fanning, Sam Riley, Imelda Staunton, Miranda Richardson, Juno Temple, and Lesley Manville. Maleficent opens in 3D on March 14th, 2014.